(Nanowerk News) Physicists at the University of Groningen led by Professor of Functional Nanomaterials Beatriz Noheda have discovered a new manganese compound that is produced by tension in the crystal structure of terbium manganese oxide. The technique they used to create this new material could open the way to new nanoscale circuits. Their findings were published on 20 November 2014 in the journal Nature ("Artificial chemical and magnetic structure at the domain walls of an epitaxial oxide"). The researchers grew a very thin layer (no more than a few dozen atoms thick) of the terbium manganese oxide crystal on a thicker base layer of strontium titanium oxide. This base layer affects the growth of the thin layer. When pieces of growing crystal meet, an interface or 'domain wall' develops, and the crystal structure comes under tensile stress in this wall. 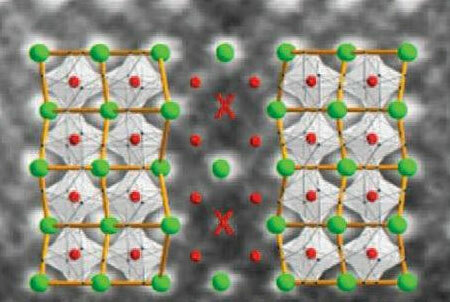 Two mirror-image domains (terbium in green, manganese in red, oxygen not shown) meet at a domain wall, where terbium atoms are squeezed out and replaced by manganese (red cross).